Once in awhile, I read a book that really gets to me. For the most part, I read a lot of thrillers and sci-fi (if I can find great old school sci-fi -- a rarity). There were moments that I had to stop reading and collect myself. We Own the Sky by Luke Allnutt is an author who pulled at the heartstrings, even from this guy who reads a lot and knows it’s only a book. Right from the beginning I knew this novel was a winner. So, for my 150th book review, this book is the perfect choice. Ron Coates lives with his beautiful wife, Anna, and their son, Jack. Everything seems to perfect in his life when tragedy strikes. Jack falls into being tired more and more and loses all his energy. An examination reveals an untreatable tumor. This initial diagnosis slowly starts to drive a wedge between Ron and Anna, which is only exacerbated when Ron defies his wife’s wishes and takes Jack for a questionable, experimental treatment in Europe. After Jack’s death, the wedge is irreparable and Ron descends into an alcohol fueled stupor. Part of his recovery is taking up the reigns of his son with photography, specifically taking shots of the sky and skyscrapers that his son loved. Slowly, he works his way out of his funk. Can he repair all that’s he’s lost since Jack’s death? We Own the Sky details his journey from a happy husband and father, to a man without direction, and back towards redemption. I love novels that are defined by the main character, which has been fully fleshed out and worthy of empathy. Ron Coates definitely fits this ideal. The reader gets to follow the protagonist through the ups and downs, glimmers of hope, and crashes of defeat. Even though we know where the storyline for Jack i going from the very beginning, Ron’s reaction is still heartwrenching. As a parent, every fear you have about the health of your child bursts forth on the pages. You want Jack to beat the disease he has, and you want Ron and Anna to beat the odds of so many married couples after they lose a child. Allnutt delivers a stark look at the reality of those situations where not everything is alway peaches and cream. Throughout reading this novel, there were moments, especially during Jack’s darkest days, that I had to stop reading and take a breath. The raw emotions of a man who has lost everything spill out from the page as you’re reading. I cannot emphasize enough how emotional it was to read this novel. Ron Coats felt so realistic as if it were less fiction and more a memoir of a difficult time in someone’s life. 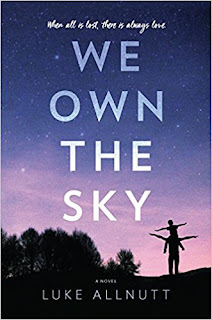 We Own the Sky is Luke Allnutt’s debut novel. It dumbfounds me that this book did not top the Best Sellers list. It definitely deserves a spot on it. This book will move you, and make you think twice about blowing off the kids when they come asking questions. You will also look at your spouse with a little different perspective after reading this. Without a doubt, this book is simply that impactful, which moves it towards one of my most favorite books. If you only have the time or energy to read one book this summer, We Own the Sky by Luke Allnutt is a top choice in my opinion. I cannot give this one high enough accolades. It is gut-wrenching, moving, and poignant. It’s definitely the top book of 2018 for me. I wish I could write a novel half as wonderful as this one. Craig Bacon reminds you to hug your kids a little tighter, and laugh with them more.